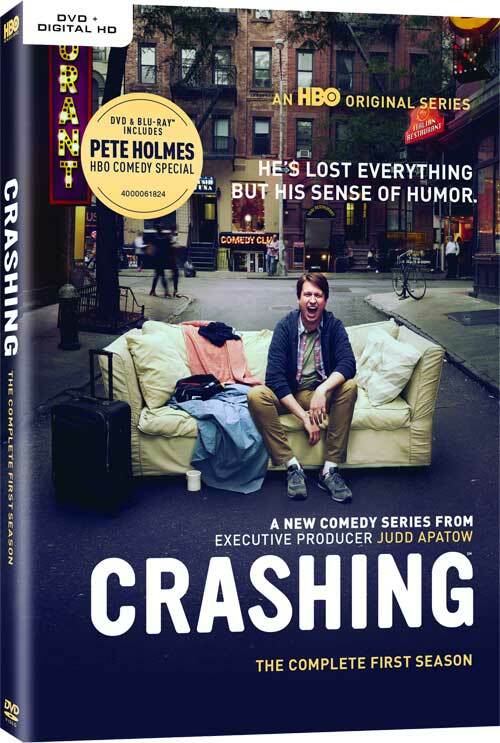 Home Features	Crashing Season 1 DVD Giveaway! Executive produced by Judd Apatow and Pete Holmes, and loosely inspired by Holmes’ personal experiences in stand-up comedy, Crashing follows an aspiring comic named Pete (Holmes), who finds out his wife Jessica (Lauren Lapkus) is cheating on him, forcing a move to New York to pursue his dream of being a comedian. Thrown into the deep end in a city that’s not for the faint of heart, the formerly sheltered Pete learns some hard lessons about life and comedy, encountering all sorts of stand-up talents along the way, from cynical guru Artie Lange, to outrageous provocateur T.J. Miller, to benevolent motivator Sarah Silverman, and many more. While trying to make ends meet by crashing on other people’s couches (hence the series name), Pete finds goodness in unlikely places, evolving into someone who’s a little more okay with the messiness of life. A love letter to stand-up, Crashing is a series about discovering humor, beauty and grace in the crazy den of thieves that is the NYC comedy scene. Our friends at HBO have given us a copy of Season One on DVD to give away! To enter, simply leave a comment below with your favorite comedian of all time. We will pick a winner on Monday, September 4th! (US and Canada only). Good luck!